Kress Restoration is a Clean Trust certified firm. We are experienced in cleaning smoke damaged items, whether it be contents or walls and flooring. 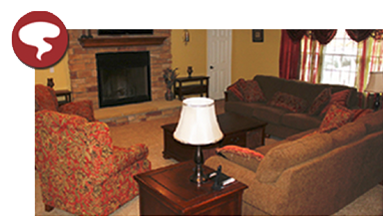 Smoke damage may be caused by a fire or malfunctions with furnaces or fireplaces. We also offer available space for storage of contents and furniture during the cleaning process. Kress Restoration uses only the best professional cleaning supplies. We value our customers and understand how devastating it can be to suffer from any type of disaster so we take pride in assisting you through these difficult times. Over 50 years of service has involved a large amount of fire restoration projects for countless home and business owners. We take pride in the quality of our service and the friendliness and loyalty of our staff. Our service areas include Mercer, Clarion, Lawrence, Butler, Armstrong, Beaver, Allegheny, Washington and Westmoreland counties.